For insurance to pay for an acute care hospital stay, a post-acute care facility or a long-term care facility, there must be a “skillable” need. (e.g. Care requiring the skill of a licensed physician, nurse, physical and/or occupational therapist.) It can’t be over stated that Medicare only pays for therapy if skilled care is needed. Walking with someone or doing exercises may not be skilled care. Admittance to these different care options is dictated by a Medicare formulary. 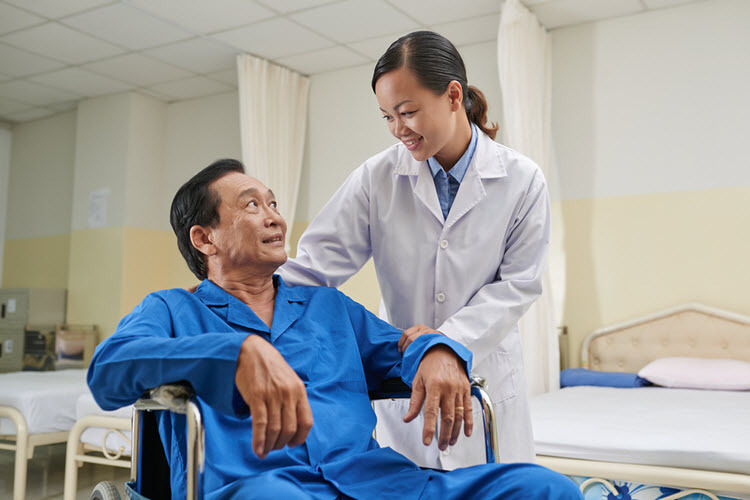 This Medicare formulary looks at the number of hours needed for patient rehabilitation and those hours determine if you will go to an acute care hospital, post-acute care or long term care facility. Medicaid only covers stays at Long Term Care facilities. Medicare pays for post care for 100 days per hospital case (stay). You must be ADMITTED into the hospital and stay for three midnights to qualify for the 100 days of paid insurance. Medicare pays 100% of the bill for the first 20 days. Days 21 – 100 Medicare pays for 80%. It is the patients’ responsibility to pay the balance or supplemental insurance will pay if the patient has it. If you have a hospital event, get discharged to a Post-Acute facility with a seven day stay, you have 93 days left of Medicaid payment for that stay. If you get readmitted to the hospital (for the same diagnosis) and get discharged to a facility and stay for 14 days, you now have 79 days left of the original 100 calendar days. People get into trouble when they are readmitted to the hospital for the same event multiple times. Suddenly there are not enough days left of original 100 to go back to the rehab facility. If you are anticipating needing short term rehab, don’t go home from the hospital and then go to a facility. You must be released from the hospital to a facility or Medicaid will not pay. There must be 60 days between hospital cases for the 100 days to reset. A limited amount of days left for Medicare to pay and the facility anticipates the patient stay being longer than the dollars allow. The cost of care is too high, newer drugs and their high cost is a major barrier to admittance. Medicare limits the amount a facility can be reimbursed per day to $560.00. If you don’t need the acute care of a hospital, but your care plan requires a $700.00 a day drug, the facility cannot take you due to the $560.00 a day cap. What are the alternatives? In a situation where the patient has acquired an infection in the hospital which requires IV antibiotics, the patient can’t be kept in the hospital because IV antibiotics does not require acute care. If the drug is too expensive and a barrier to a facility, then you will probably go home with a referral to an IV home company that can administer the drug. Emily Lintag is a hospital and health care professional who has served as a sub-acute rehabilitaion nurse, assisted living charge nurse and wellness nurse. In addition to serving as coordinator and hospital liaison with several rehabilitation facilities.